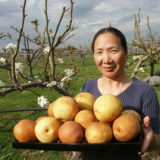 Producer of gourmet Asian pears, jujubes and chestnuts. Free tastings in season. Local raw honey, homemade Asian Pear marmalade and topping, Blue Hubbard and Butternut Squash, and pumpkins are available. Order pear gift boxes online. Picnic pavilion. Groups Welcome. Virginia Gold Orchard is located eight miles south of downtown Lexington on Rt. 11. From I-81, take exit #180 and follow Rt. 11 north approximately 1 mile. Virginia Gold Orchard is on the left. Open Aug-Nov: Wed-Sunday from 10am-6pm (closed Mon and Tue).